What's an app without the ability to tinker with it? All Roblu software is open source and you're free to make it yours. Roblu works out of the box and with well documented and complete source code, you can easily add, modify, or remove components to fit your team's needs. You don't just have access to a scouting system, you have access to a learning playground for app development. Who said learning can't be fun? Roblu is the most powerful scouting solution on the market. With year to year support, a beautiful user interface, customizable forms, custom sorting, detailed analytics, quality tutorials, seamless syncing methods, a fully customizable user interface, and much more, Roblu is a no-brainer. Roblu's sync system has two core concepts in mind — simplicity and functionality. Use network syncing, Bluetooth syncing, QR code syncing, or a combination of all three to get data across multiple devices. We know syncing can make or break a scouting app, so that's why the syncing system has been designed from the ground up to make syncing problems a thing of the past. Custom forms are the defining feature of Roblu. Custom forms enable your team to tell Roblu how to adapt to your team's scouting strategy, not the other way around. Roblu supports 10 different metrics that can be configured to your scouting strategy. These metrics are always editable and will be synced across all devices. Roblu allows you to search, sort, filter, and generate graphs off your own metrics. With custom forms, Roblu works for any event and any year. All of Roblu's features are documented in nine quality tutorial videos. With a full documented tutorial series and code base, Roblu is easy to learn and easy to use. After all, a scouting system isn't powerful if you don't how to use it. Roblu has a UI customizer for customizing almost every aspect of the app. You can change the look and feel of Roblu to match your team and make it yours. Roblu is frequently updated. If you have auto-updates on, your app will automatically receive the latest goodies from the Roblu Development team. With Roblu, you can tinker with code and learn how apps, desktop applications, and servers work. Roblu isn't just a scouting system, it's a learning playground where you can learn while you code for a useful scouting system. Roblu's code is well documented and a powerful tool for introducing students to computer programming. What makes Roblu the most powerful solution to scouting? Year to year support - Roblu uses a custom form system. With Roblu's custom form solution, you'll be able to define how YOU scout. Not the other way around. There are ten unique scouting metrics to choose from: boolean, counter, slider, chooser, checkbox, stopwatch, text field, image gallery, field diagrams, dividers, and custom calculations. Create your own form for each event, import predefined forms, or create a master form each year and use it for all events. With fully custom forms, the possibilities are literally endless. Beautiful user interface - There are dozens of scouting solutions out there that work, but have confusing or illogical user interfaces. Roblu's interface is simple - it's easy to use and understand - but advanced. Roblu's interface is fully customizable, simple, and clean. You can pick up the app and know how to use it right away. Custom sorting and analytics - Data isn't useful if you can't analyze it. 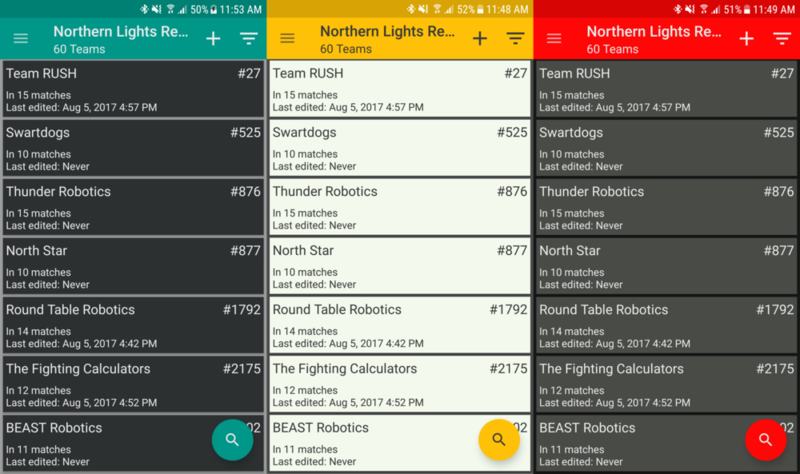 With Roblu, you'll be able to sort scouting data by specific metrics, matches, match wins, and much more. Roblu also automatically generates statistics off of your scouting data and presents them cleanly in graphs and tables. Roblu has built in exporting to .csv, and full Tableau support import. https://www.thebluealliance.com (TBA) integration - With Roblu, it's super easy to setup an event. When creating an event, Roblu will automatically import teams, matches, match wins, and more. Roblu uses its own TBA API and can will keep you up to data with the latest info from TBA. Seamless syncing - Roblu Cloud syncing works automatically in the background, Bluetooth syncing is the easiest it's every been, and QR is always there as a third choice. Roblu syncing works well and will get data where it needs to be. Tutorial videos - Roblu has quality tutorials available for any aspect of the app. A scouting app isn't powerful if you don't know how to use it. Backups - Backup your scouting data with an export to backup file. Your data is safe, we're both counting on it. UI customizer - Make Roblu your own with nine different UI settings including colors, animations, and more. With Roblu Cloud, UI is synced across all devices for a consistent and unique scouting experience. Network syncing - Roblu Cloud is the recommended syncing solution, Roblu apps use a background service to automatically download and upload completed scouting data when a connection is available. Network syncing emphasizes automatic — you won't need to press any buttons for a sync to occur. Setup syncing with only a few taps. Host your own server for free, or pay $10 a season for the 24/7, officially supported Roblu Cloud server. Bluetooth syncing - Bluetooth syncing works offline and is a great secondary syncing solution. It is slightly more limited than network syncing, but gets the job done. Bluetooth syncing moves all the setup away from the syncing process, so you'll only need to press one button to sync to a device. QR code - QR codes are a great fallback syncing method for getting data transferred quickly.